Mold has been one of those silent issues that everyone knows is there, but failed to talk about it for quite some time now. Little has been done through the federal, state and local levels of government to establish authority over this nuisance. Let’s start talking about it so that you as a landlord can be well informed about what to do in case your rental property has a mold problem. Mold has developed into an environmental health hazard causing concern in the rental community. Although most of the mold found in a typical area in your home is not dangerous, it is not to be taken lightly since it has been known to cause rashes, chronic fatigue, nausea, cognitive loss, and asthma among tenants who have won lawsuits claiming the mold caused the nuisance. Mold can appear in many shapes, colors and sizes. Some are black, white, green or gray. Some are powdery while others are shiny. Some smell terrible, others hide out and have no smell and are more difficult to detect. The thing to remember here is that mold loves moisture. It is often found in water soaked materials such as wall paneling, fabric, ceiling tiles, cardboard boxes and dry wall. Mold is more prone to appear in naturally humid climates such as Texas, California and other southern states, but it will grow whenever conditions are right in any part of the world. Which molds are okay and which molds are dangerous? This is a highly debated question in the scientific world. There is a lot of debate about which molds and what situations can pose serious health risks to people in their homes and apartments. There is no doubt, however, that some people have suffered the consequences of inhaling mold spores. Close to all molds are not harmful to your health, though. It takes an expert to know whether or not a particular mold is dangerous to your health or if it’s just an annoying nuisance. The only real true way of knowing a mold has been in someone’s body is by measuring the levels of a mold’s DNA in a person’s blood sample. Up until recent years, little effort has been made to cover the legality of mold infestations, especially in landlord tenant law. Federal law has no regulation on permissible limits or building tolerance for mold levels in residential buildings. State laws have only recently been slowly starting to take effect. Only a handful of states have set a “limit” of tolerable limits of mold for indoor air. Some places on the local level, like say New York city have established that the landlord must follow the Department of Health guidelines for indoor air quality. San Francisco has considered mold a legal nuisance, which means it’s in the same category as trash accumulation or an infestation of vermin. Landlords can be sued under private and public laws if the landlord fails to clean up serious problems. Mold caused by a landlord’s failure to fix leaks. 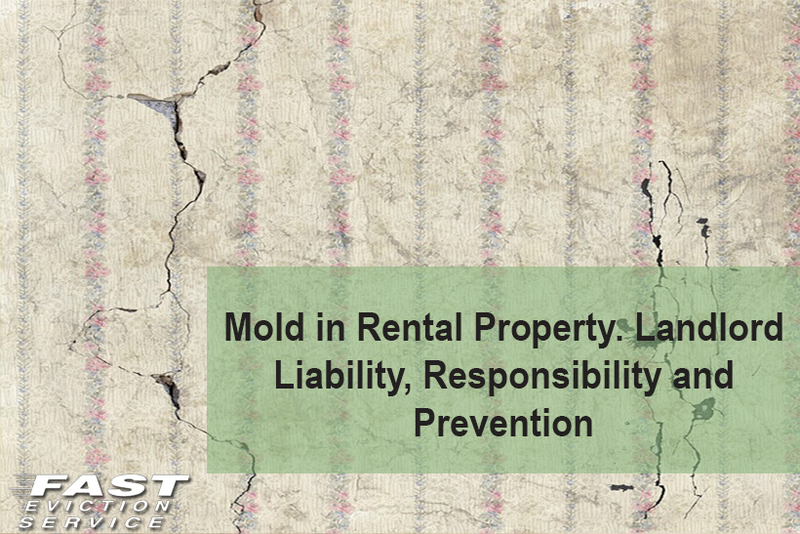 If it is determined that the mold problem has been caused by the failure of the landlord to fix a reported water leak, then the landlord is liable for any health damages caused by the infestation. The tenant is held responsible when it is determined that the tenant failed to upkeep the premises with necessary cleanliness, or by not allowing bathrooms and kitchens to ventilate properly. When the tenant’s own negligence is the cause of the problem, the landlord is not to be held liable for any problems. At the end of the day, landlords and tenants should work together to avoid having this be an issue in the first place. With proper cleaning and maintaining of the rental property, there shouldn’t be any issues to arise from mold. Is Your Rental Property Considered Uninhabitable? What Is Constructive Eviction In California? Are Landlords Responsible For Bed Bugs In Rental Property?